NBA should have the “Steph Curry” rule. The ability to renegotiate a contract after the 3rd anniversary even if the team is over the cap. This is an interesting idea and Steph Curry shows that this type of rule would certainly benefit some players who are playing well below their market value. Of course this would be a point of major disagreement between the owners and the players association if the idea gained traction before the new CBA negotiations. Below I will detail what the current renegotiation rules are and what a Steph Curry Rule might look like if it were enacted. Currently, contract renegotiation can only take place after the third anniversary of the signing of the contract. This limits the contracts that can be renegotiated to those that have terms of four or more seasons. However, rookie scale contracts are excluded and cannot be renegotiated. It is important to distinguish a renegotiation from an extension. An extension extends the number of years a player is under contract with his team. A renegotiation, on the other hand, is simply changing the dollar amounts for the remaining term of the contract. Under the current rules, only teams who are under the salary cap may renegotiate a player contract and it can only be done between July 31 and April 30. The renegotiated amount cannot exceed the teams cap room and it is limited by any naturally occurring salary restrictions. Technically, you are only renegotiating the upcoming or current season once you surpass the three-year requirement. However, once that first year is renegotiated, the remaining years on the contract must also be increased. In no event may the contract be renegotiated to decrease the player’s salary or bonuses. So for example, in 2011 Mike Conley signed a 5-year, $40,000,000 contract. Let’s say that in October of 2014 he wanted to renegotiate and the Grizzlies were under the salary cap. Under the original terms of his deal, he was owed $8,694,216 in 2014-15 and $9,338,246 in 2015-16 with $200,000 of likely bonuses for the last season. So if the Grizzlies had enough cap space to pay Conley $10,000,000 in 2014-15, Conley’s $9,338,246 salary in 2015-16 would have to be increased. It could be increased up to a limit of 7.5% of his new 2014-15 salary, giving him a total salary in the final year of his contract of $10,750,000. His $200,000 bonus would not be required to increase because the first renegotiated season did not deal with a bonus. If, however, a 2014-15 bonus existed and was renegotiated, the $200,000 2015-16 bonus would also need to increase. A Steph Curry rule would allow players on teams that are over the salary cap to renegotiate their contracts in order to collect a salary closer to their market value. Because this rule would apply to teams over the cap, it would have to be added to the CBA as an exception rather than simply an additional renegotiation rule. The major obstruction to implementing this rule is getting the owners on board. Teams and owners save money when players outplay their contracts and it allows teams like Golden State to pay for more talent they might otherwise not have be able to afford. In 2013, fresh off of a rookie scale contract and slew of serious ankle injuries, Curry signed a fair 4-year, $44,000,000 million contract. If Curry had signed a four-year deal at the 25% max, his contract would have been closer to a 4-year, $61,000,000 deal. So even ignoring the recent cap spike and enlarged max contracts, Curry, having shown his max player ability, missed out on almost $20,000,000 over the course of his contract. In order to recoup some of that lost money, what if we had a Steph Curry rule, allowing a player to renegotiate his contract after the third anniversary of its signing even if his team is over the cap? To construct this rule, there has to be limitations strict enough that the owners might agree to it. The fact that a contract term must be at least four years in order to renegotiate is one limitation naturally in place. 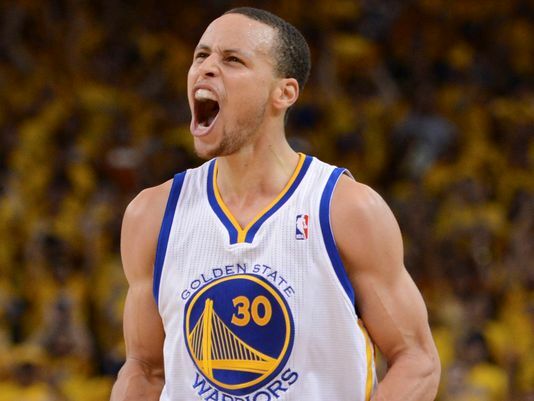 So other than the current renegotiation rules, what might the Steph Curry rule look like? (1) The player must not be under a contract that was once a max contract. This would eliminate players like Kevin Durant, DeMarcus Cousins, or John Wall to renegotiate a higher salary simply because the cap has gone up. (2) The player must have accomplished at least one of the following: (i) was voted MVP or (ii) was voted 1st or 2nd Team All-NBA in two of the last three years. This severely limits this rule’s reach. The only players available right now are Steph Curry, LeBron James, Chris Paul, Kevin Durant, James Harden, Blake Griffin, Marc Gasol, and Russell Westbrook. Every player on that list other than Steph is eliminated based on the first provision or a rule already in place. The CBA currently has a number of rules that base salary on individual accomplishments, so this would not be all that unique. (3) The renegotiated salary of the first renegotiated year cannot exceed the maximum the player could have received in that year at the time the original contract was signed. In other words, if Steph Curry was allowed to renegotiate his salary for 2015-16, he could not be paid more than $16,826,355, the amount he would have made if he were given a four-year contract at the 25% max in 2013. This does a couple of things. First, it would prevent Curry from getting a benefit that players like Durant are barred from under the first provision. And second, it would also limit the burden put on team cap sheets and owners’ pockets. One last possible restriction that I will not make official here because it would ultimately bar Curry from the theoretical rule that bears his name, is that the team can be over the cap but it cannot be over the luxury tax either before or after the renegotiation. That might go a long way in getting the owners to agree to it, but it also may make the rule so restrictive that almost nobody qualifies or will benefit from it. But the rule laid out above is certainly limited in scope and ultimately still leaves the player subject to the willingness of the owner and GM to agree to a renegotiation. Although a team may conduct an extend-and-trade where the player is extended and simultaneously traded. A team may not renegotiate-and-trade a player. Raises of salary and bonuses after the renegotiated season are limited to 7.5%. A few examples: (i) starter criteria for a higher (or lower) qualifying offer; (ii) MVP, voted twice into the All-Star Game, or (iii) two appearances on an All-NBA team. This is not entirely true. If Curry’s deal was for five seasons instead of four, then he would get a slight benefit because his 2017-18 salary would be 107.5% of his 2016-17 salary and normally raises are restricted to 7.5% (or 4.5%) of the first year of the contract.